Xu Beihong’s Galloping Horse is being auctioned in Hong Kong next month. An artwork portraying a galloping horse by Chinese artist Xu Beihong is expected to fetch between $US150,000 and $230,000 when it is auctioned at Christies in Hong Kong next month. The work, titled “Galloping Horse” is inscribed and signed, with two seals of the artist, who created the ink work in 1939. The piece, which is from the collection of the late Professor Arthur Lim, is among a sale of fine Chinese Modern Paintings on June 2. 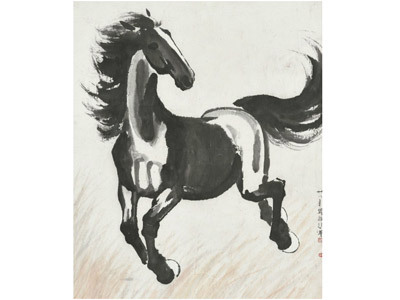 Xu Beihong (1895-1953) was primarily known for his ink paintings of horses and birds. Xu constantly pushed the boundaries of visual art with new techniques and international aesthetics, in bid to reinvent Chinese art. Xu died of a stroke in 1953. After his death, a Xu Beihong Museum was established at his home in Beijing. In 2013, a 24-episode history soap opera depicting Xu’s life from early adulthood until 1949 was produced in Hebei and aired on Chinese television.